Safety Science serves as an international medium for research in the science and technology of human and industrial safety. It extends from safety of people at work to other spheres, such as transport, energy or infrastructures, as well as every other field of man's hazardous activities. Safety Science is multidisciplinary. Its contributors and its audience range from social scientists to engineers. 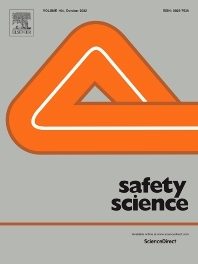 The journal covers the physics and engineering of safety; its social, policy and organizational aspects; the assessment, management and communication of risks; the effectiveness of control and management techniques for safety; standardization, legislation, inspection, insurance, costing aspects, human behavior and safety and the like. Papers addressing the interfaces between technology, people and organizations are especially welcome. Safety Science will enable academic researchers, engineers and decision-makers in companies, government agencies and international bodies, to augment their information level on the latest trends in the field, from policy-makers and management scientists to engineers. The journal focuses primarily on original research papers across its whole scope, but also welcomes state-of-the-art review papers and first-hand case histories on accidents and disasters of special significance and discussion papers on hot topics.